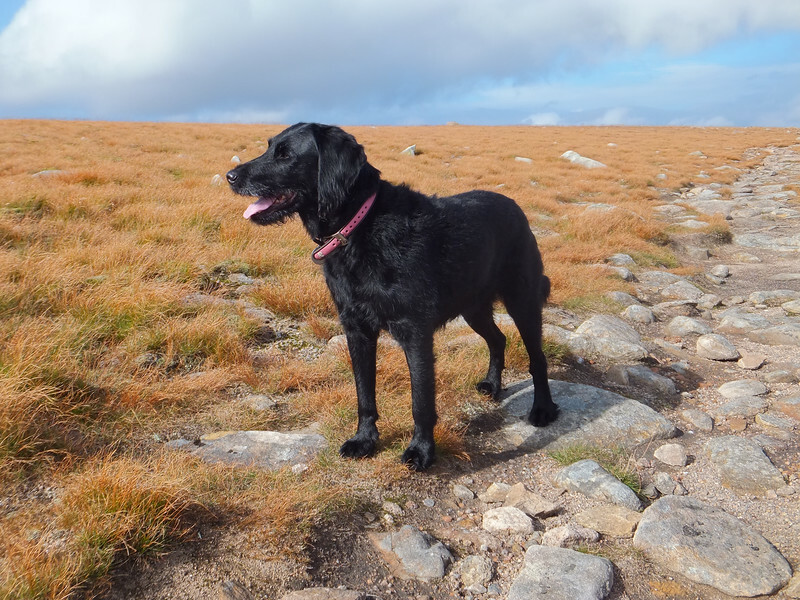 splendid isolation: Happy Eighteenth, Jorja! 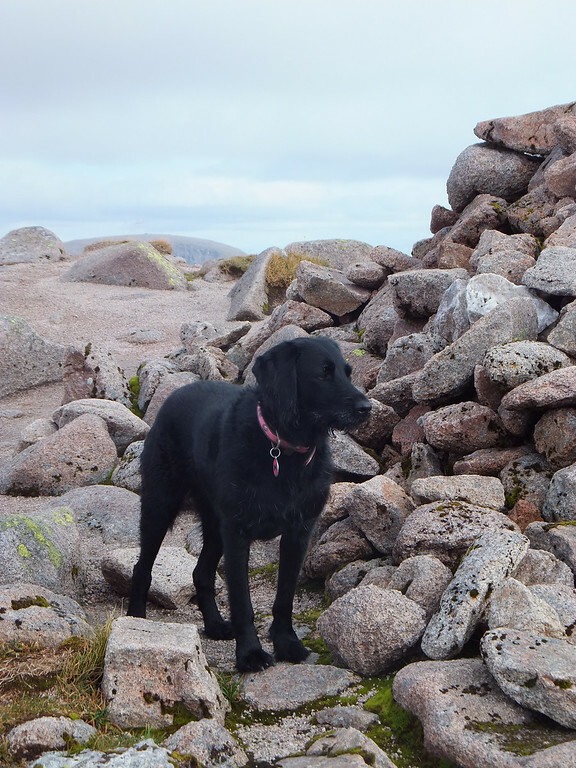 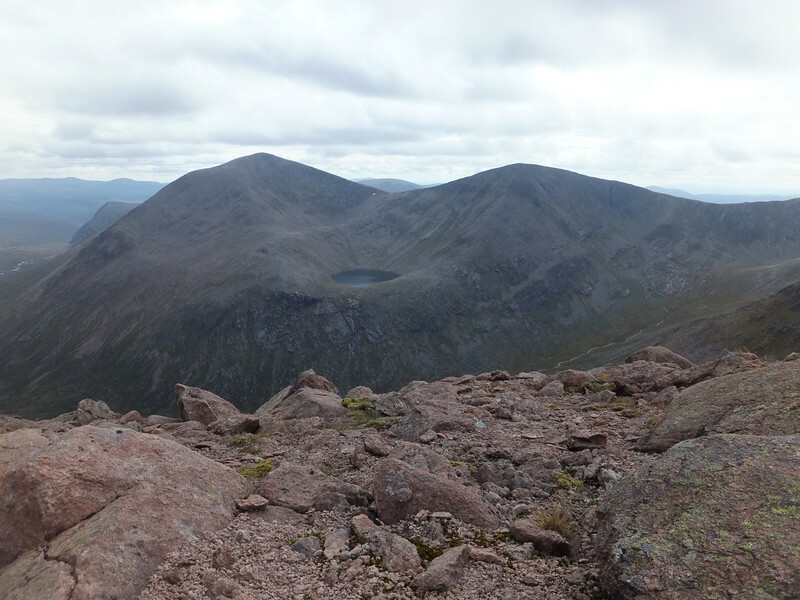 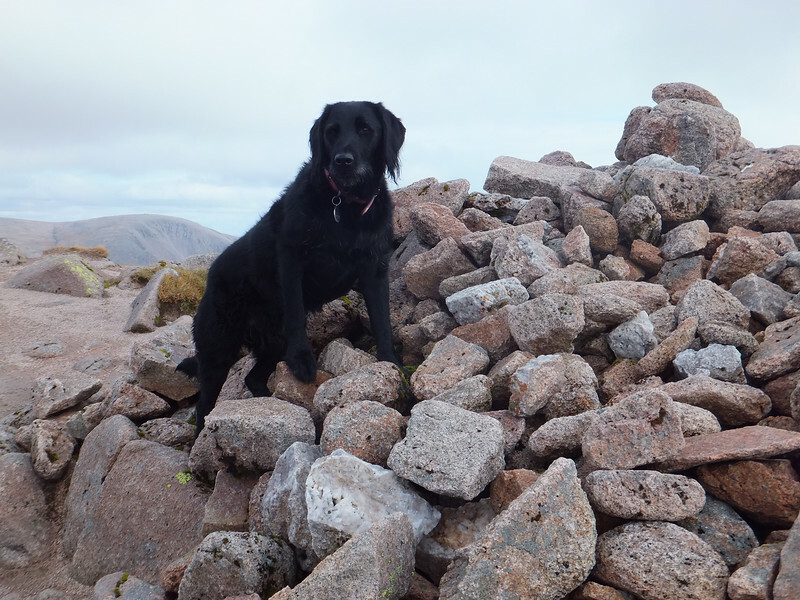 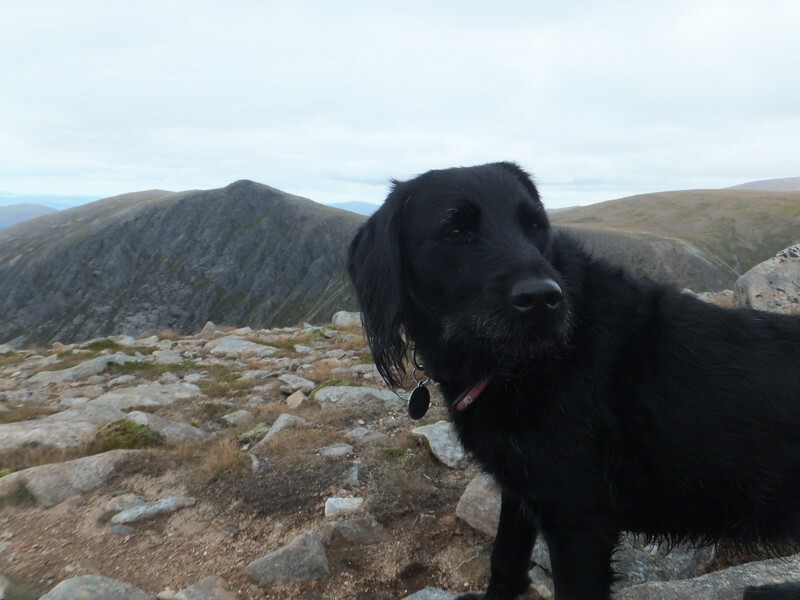 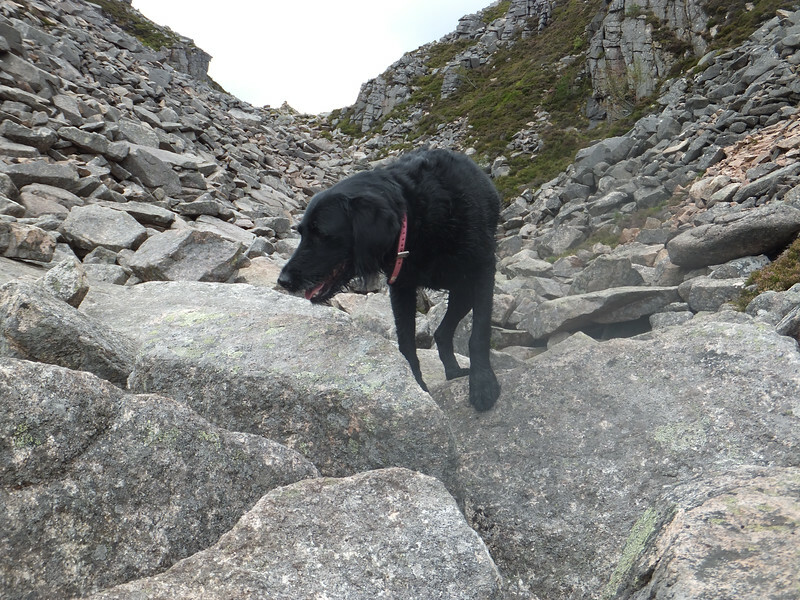 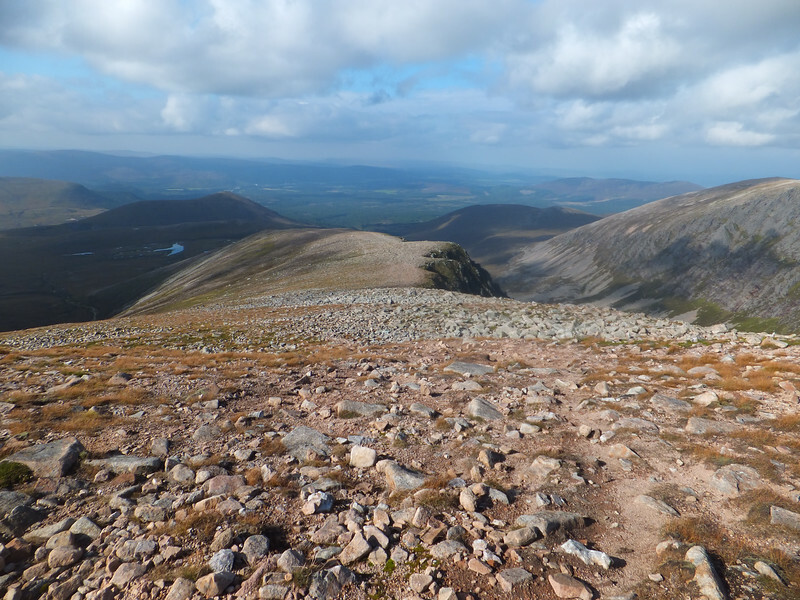 That's nothing to do with her age, but in something of an odd coincidence it was last Tuesday, after me and the WBD returned from Braeriach - her last outstanding Cairngorm Munro - that for the first time ever I kind of noticed she was utterly exhausted after a hillwalk. 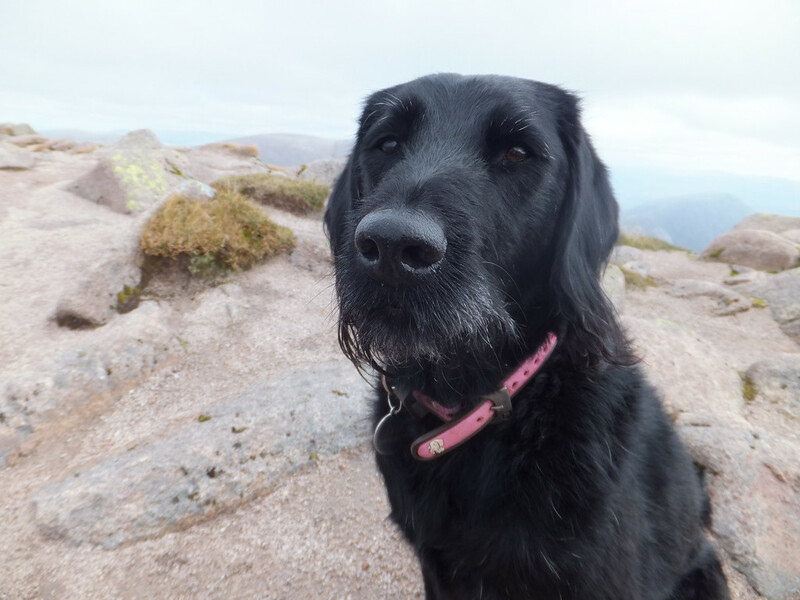 She's been tired before, admittedly, but never has she seemed reluctant to get out of bed for a biscuit. 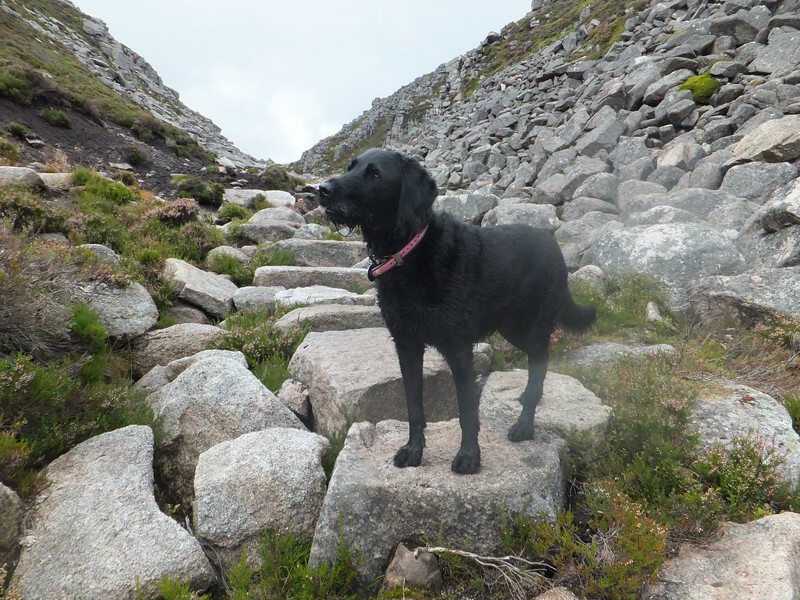 She's very like me in that regard. 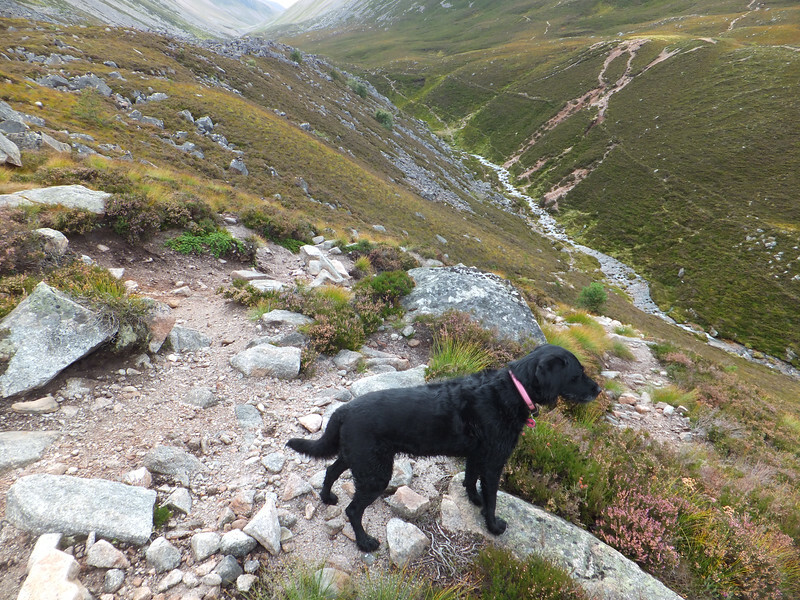 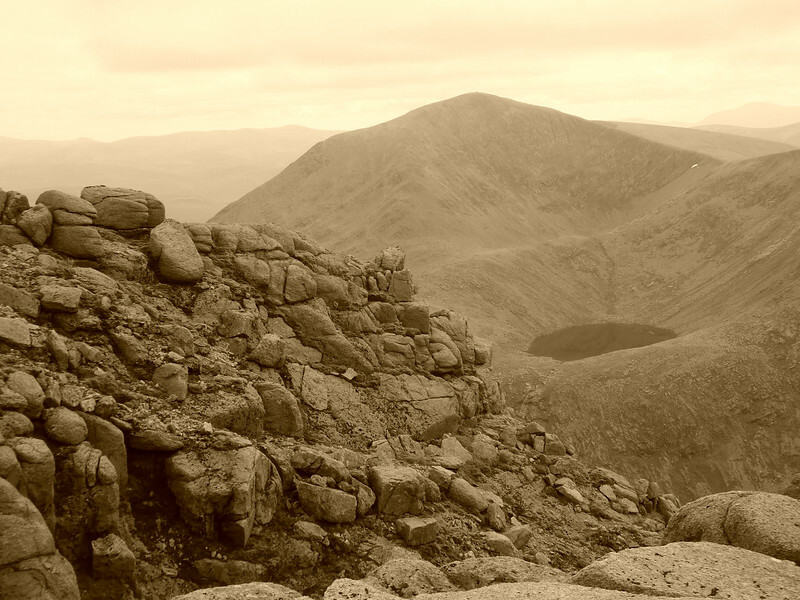 Further deliberations have tended to suggest that it was maybe the nature of the terrain - dry ground, mostly unforgiving hard paths, somewhat exacerbated by the Chalamain Bloody Gap - rather than the lessening of her stamina that had combined to cause her ills, because no more than four days later she was haring up Gairich like a puppy. 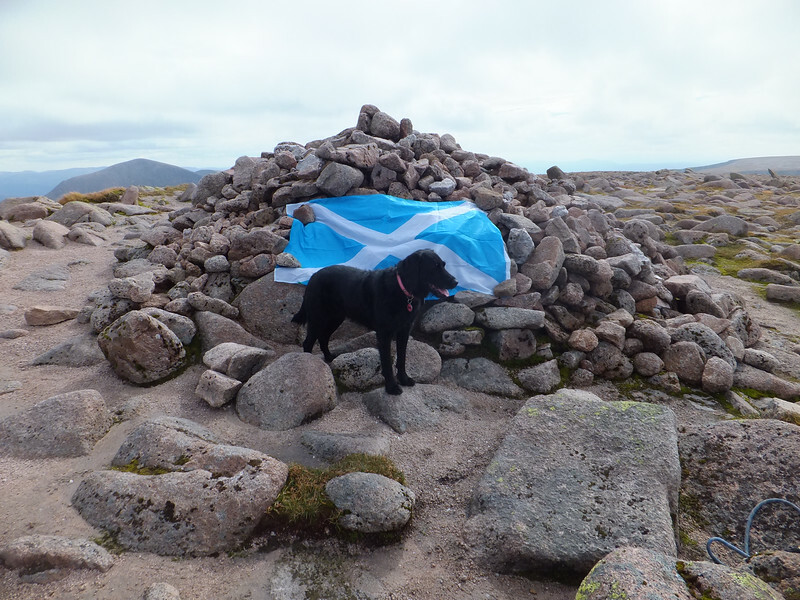 (More of which anon). 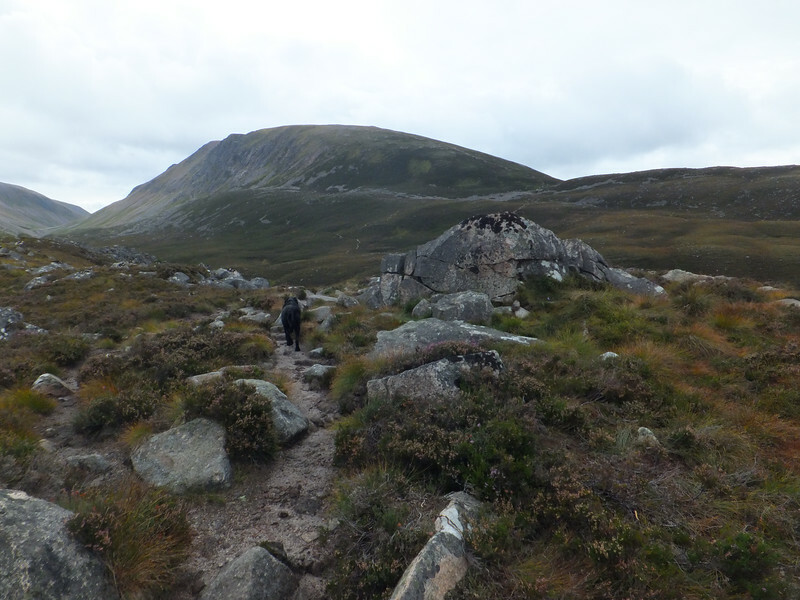 In another odd coincidence, Gairich got a mention in the post about my first visit to Braeriach. 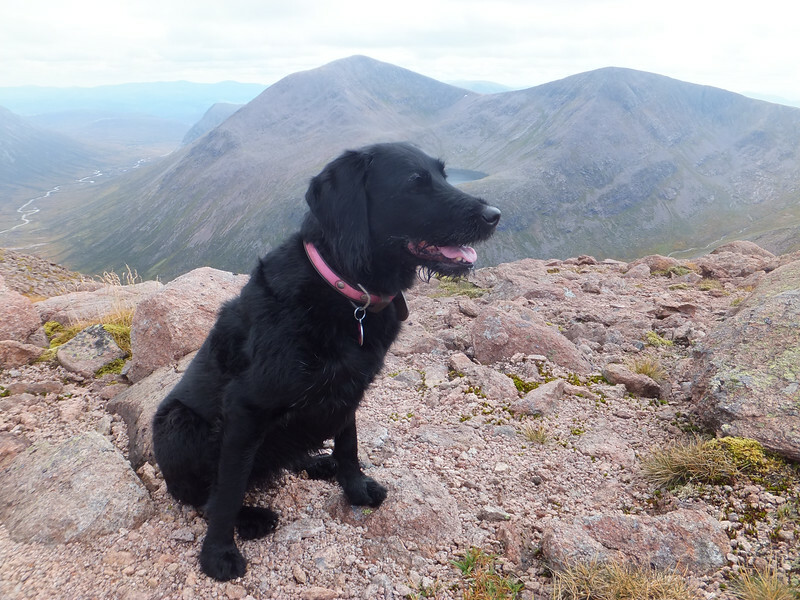 So it's nice to report that it's only taken us about five and a half years to get up that yin too. 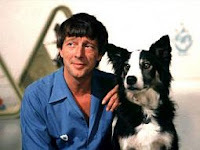 There's not a lot to add to the first report. 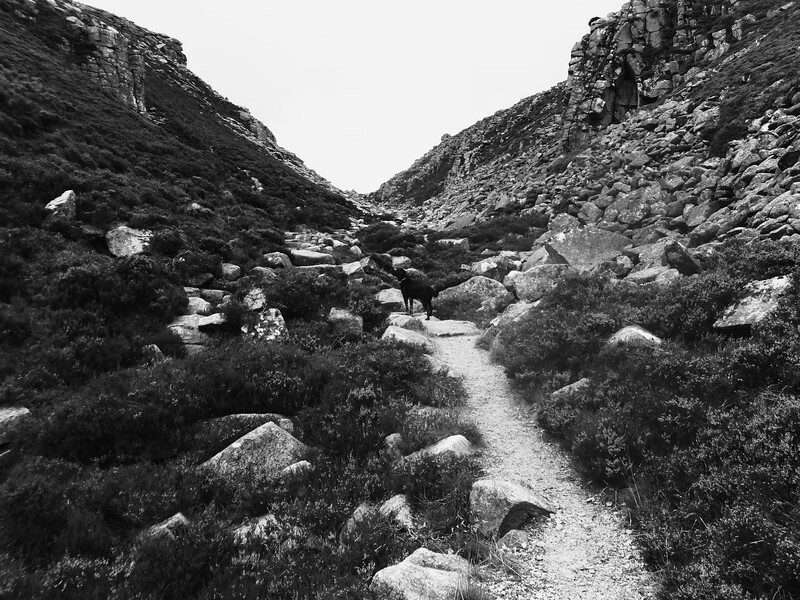 I started from the same spot, took the same route up, got similar good weather and took hundreds of photies, the vast majority of which will never see the light of day. 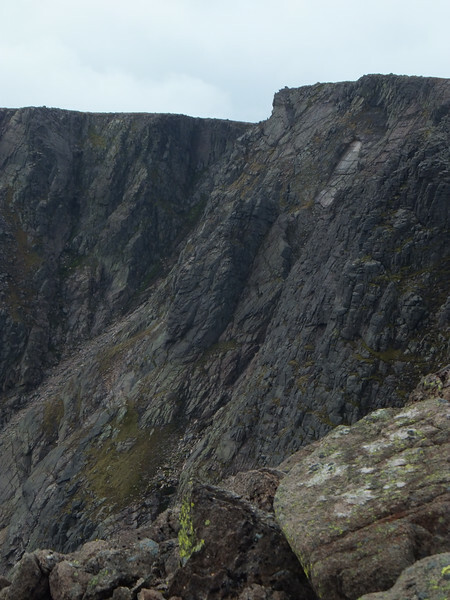 I will observe that the Chalamain Gap (no doubt partly due to relatively recent tragedy occurring therein) remains a place that one would not want to linger. 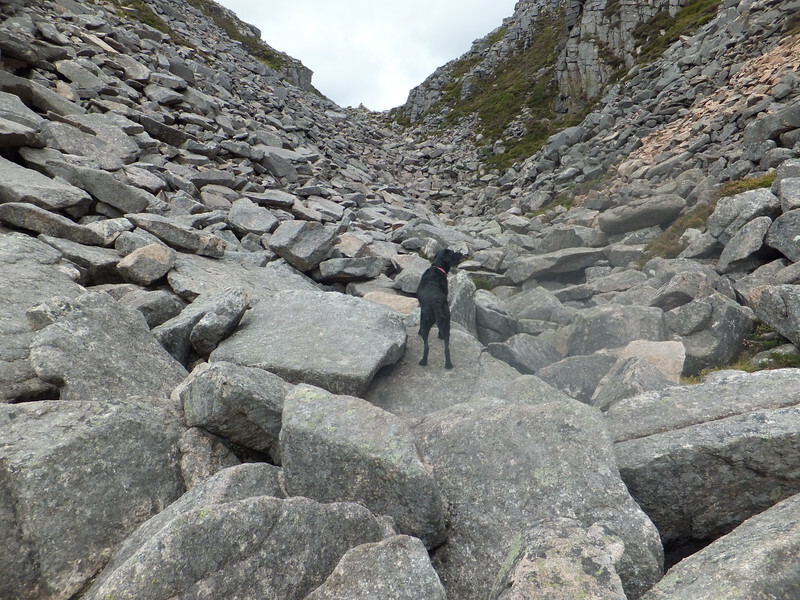 There looks to be, to this inexpert eye, rather more in the way of unstable slope-poised boulders than before, and there's an unsettling feel about the whole affair. 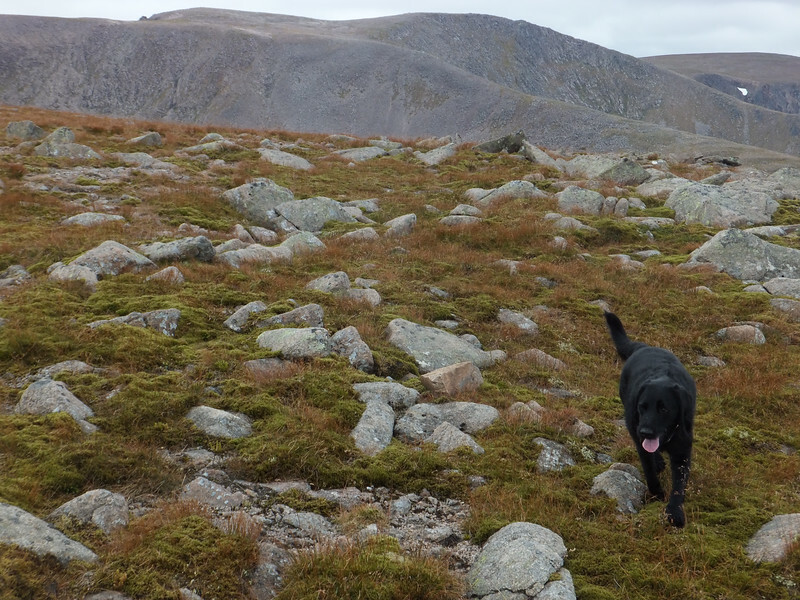 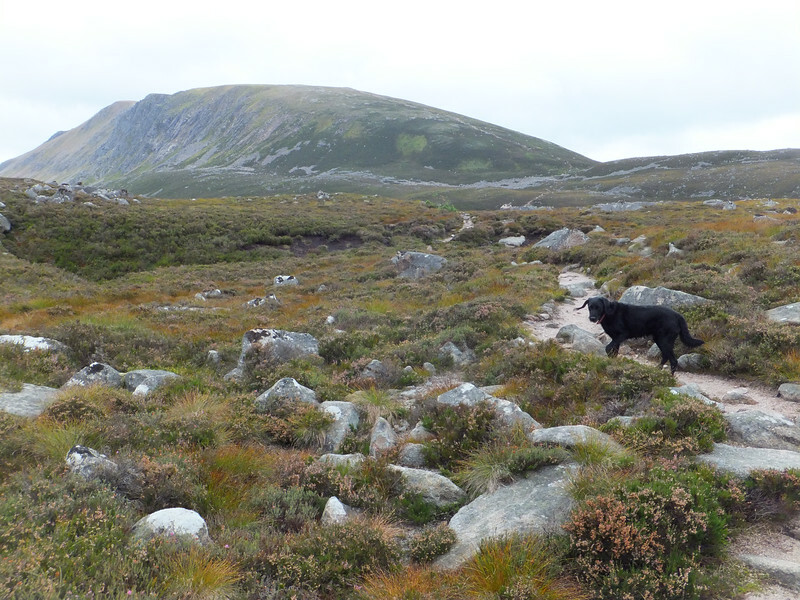 Jorja managed without too much bother on the way to the hill, but on the walk out I decided to head up and over Creag a' Chalamain. 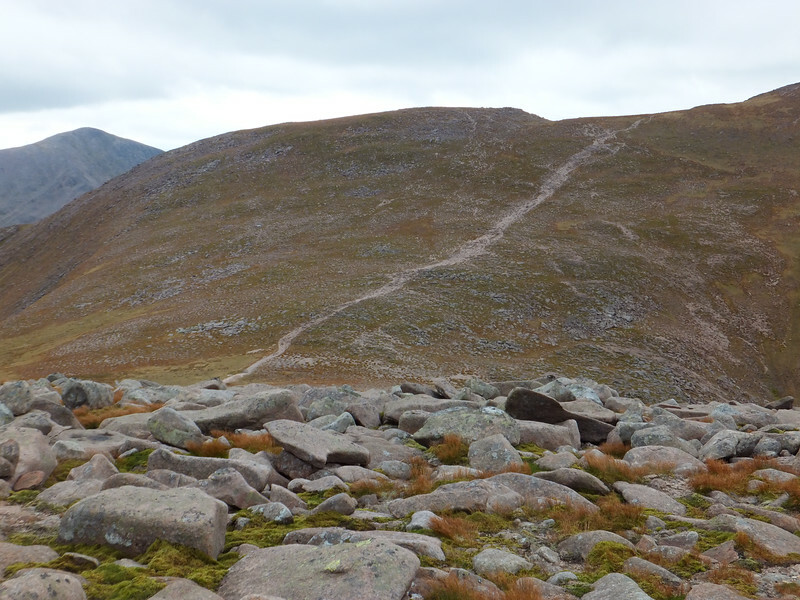 There's an obvious path that takes you to its summit, but there's also a developing side/contouring path that I stumbled across, having left the main drag after a 100 metres or so. 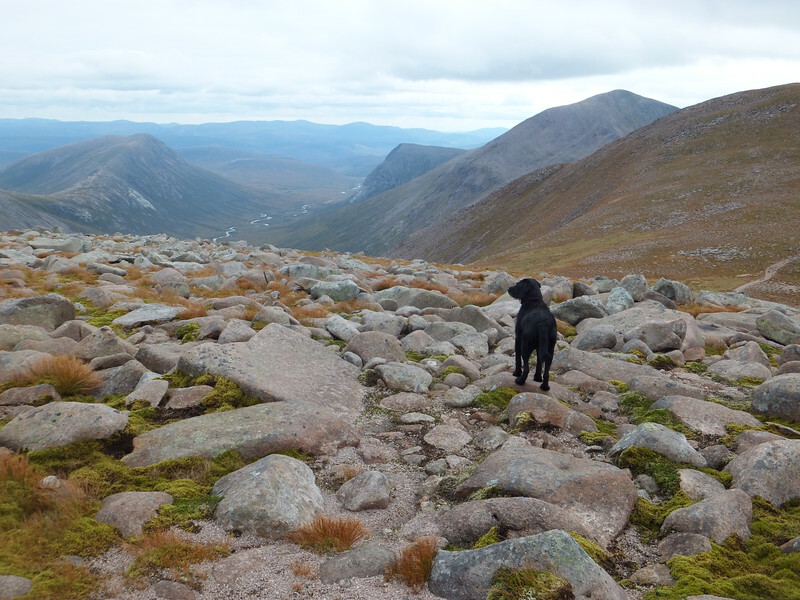 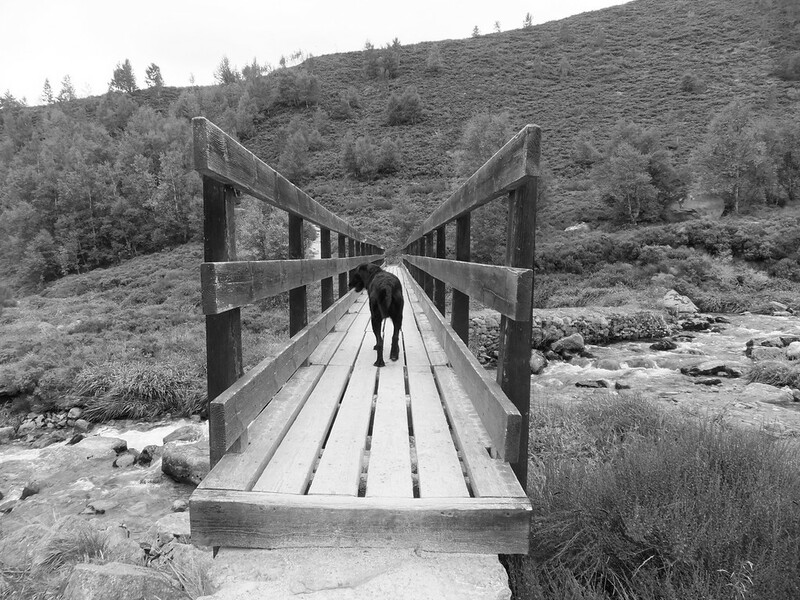 It's eminently spottable on the outward journey, and although it'd steepish from that direction for the first wee bit, I still tend to think it'd be worth it for canine-accompanied folk. 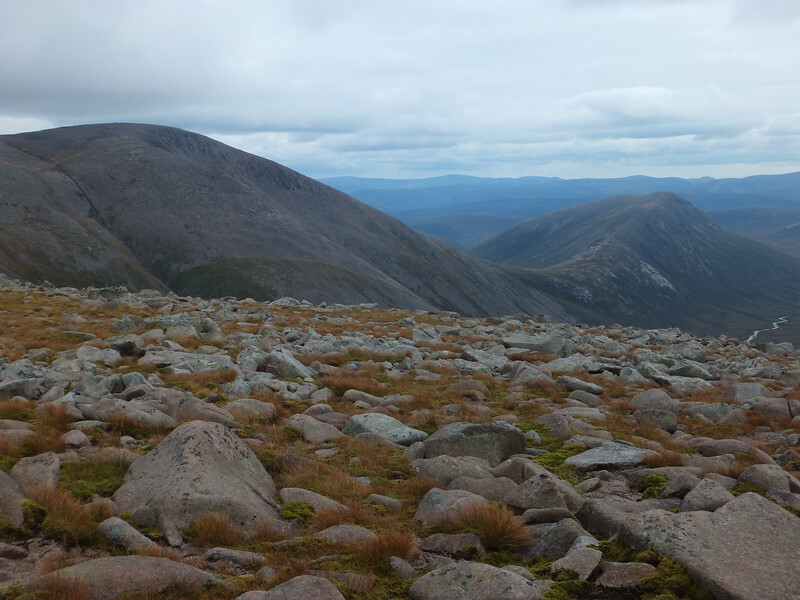 For those that are interested, Ronald Turnbull's "Walking in the Cairngorms" route description (slightly abbreviated here on account of my rubbish typing ability) is all you need. 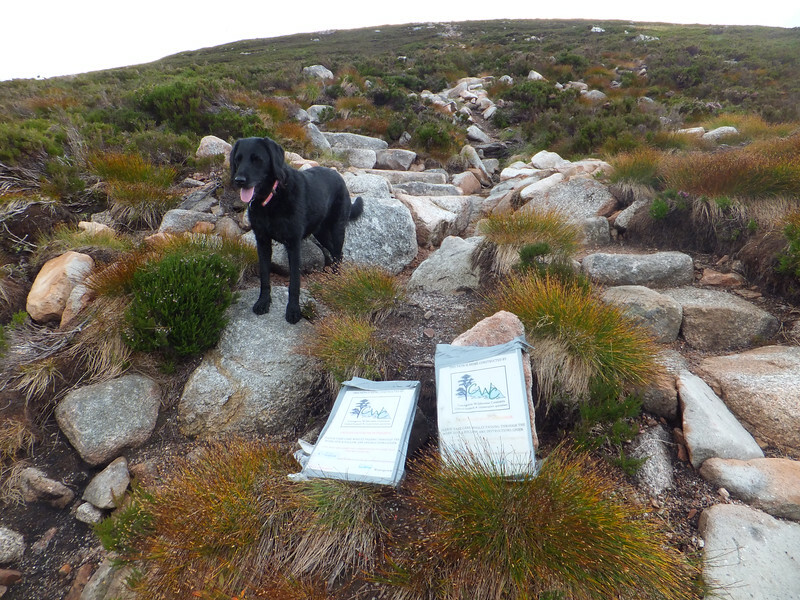 If you've got a map and compass, like. 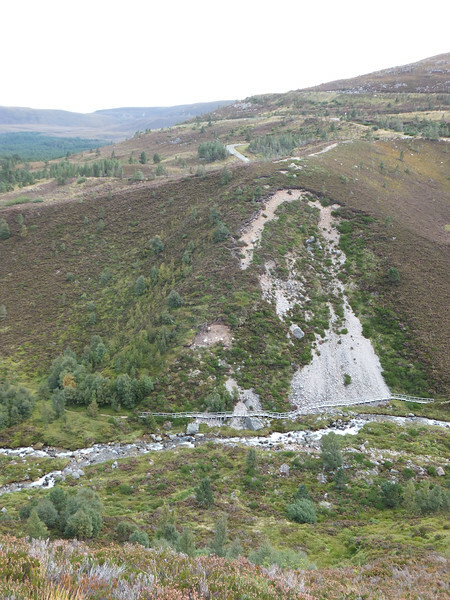 Start from the Sugar Bowl car park, and drop South to a long footbridge. 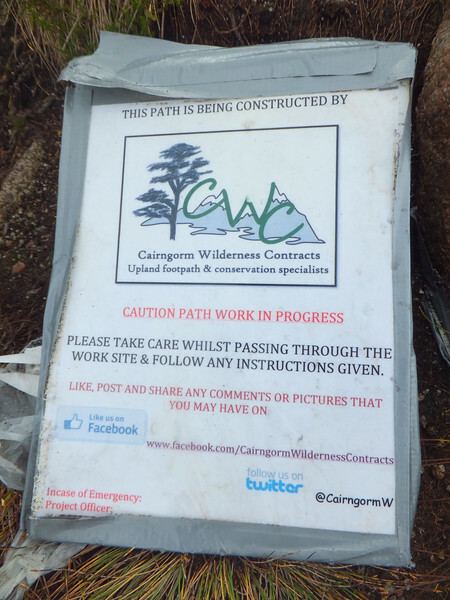 It is signed for the Chalamain Gap. 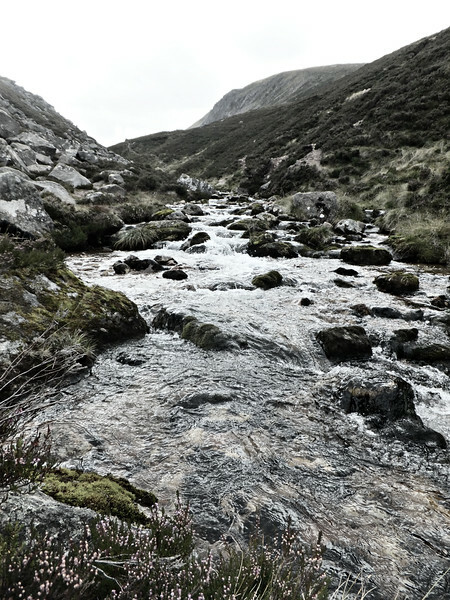 The path climbs the bank above the river and turns upstream, wide and clear. 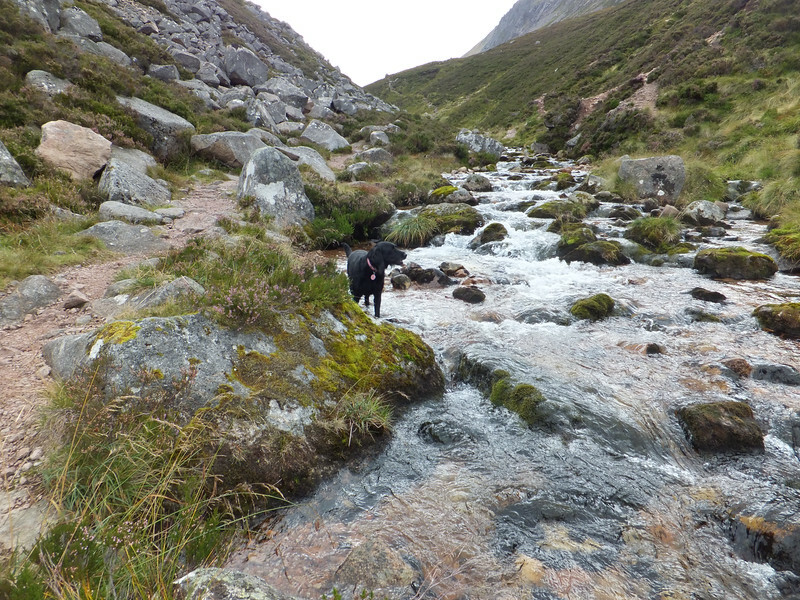 Soon it bends right (west) above the valley of a smaller side stream and then drops to cross this. 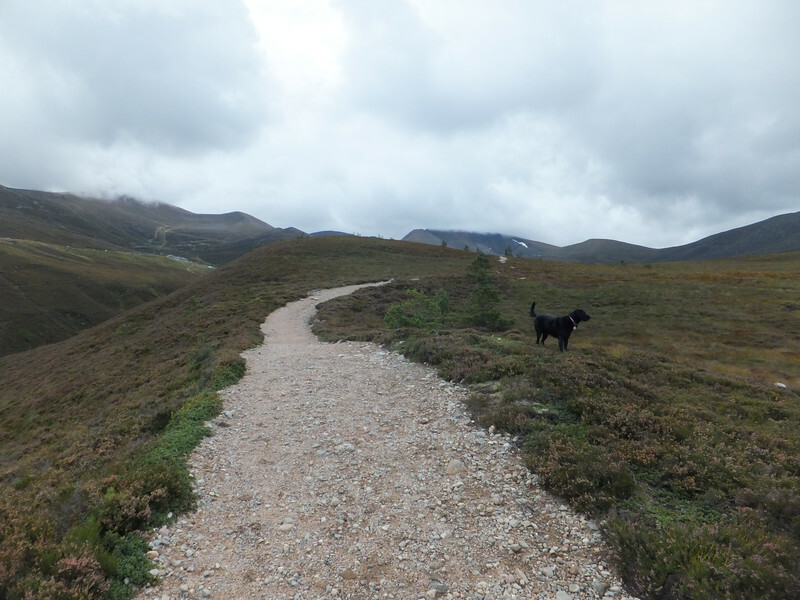 The path continues southwest to enter the Chalamain Gap. 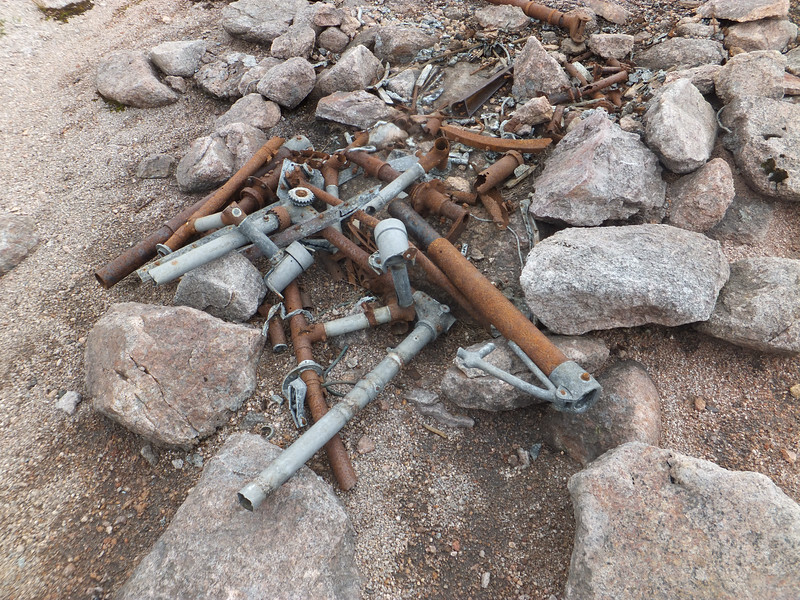 This continues for 300m. 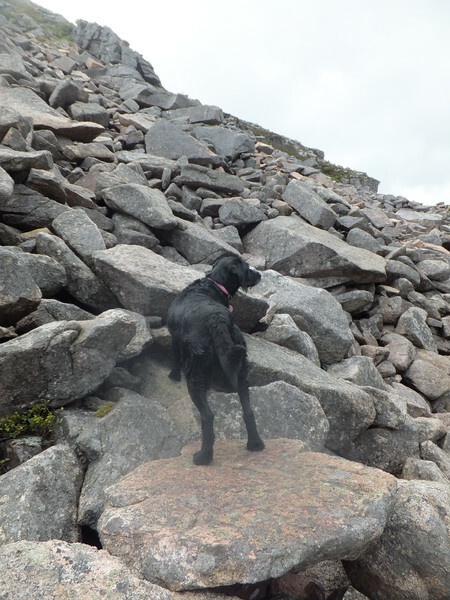 At its top, continue ahead on a clear path southwest. 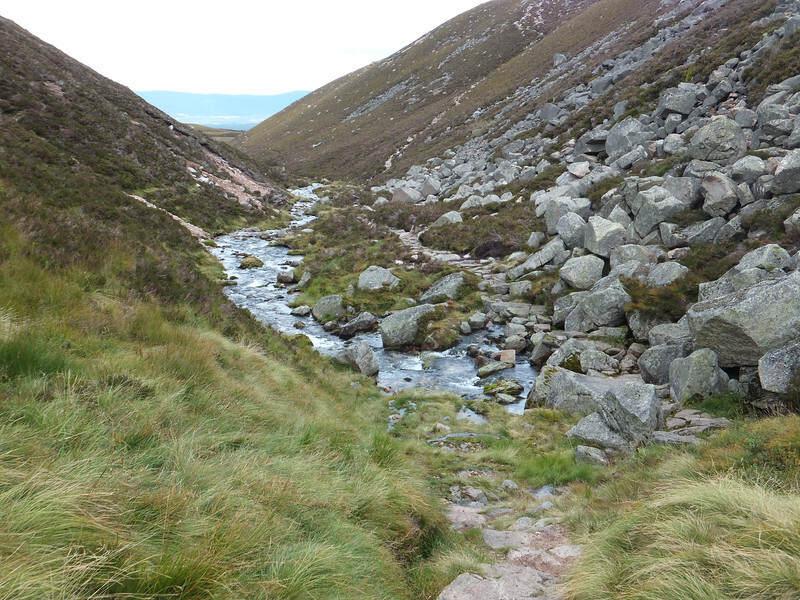 This slants down around the end of Lurcher’s crag, then drops with engineered steps to the Allt Druidh. 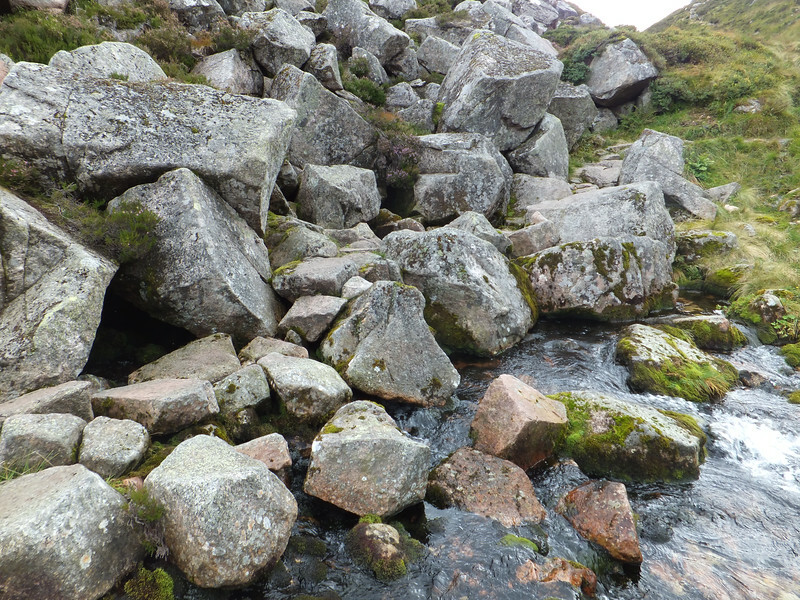 ...and slants up the opposite bank. 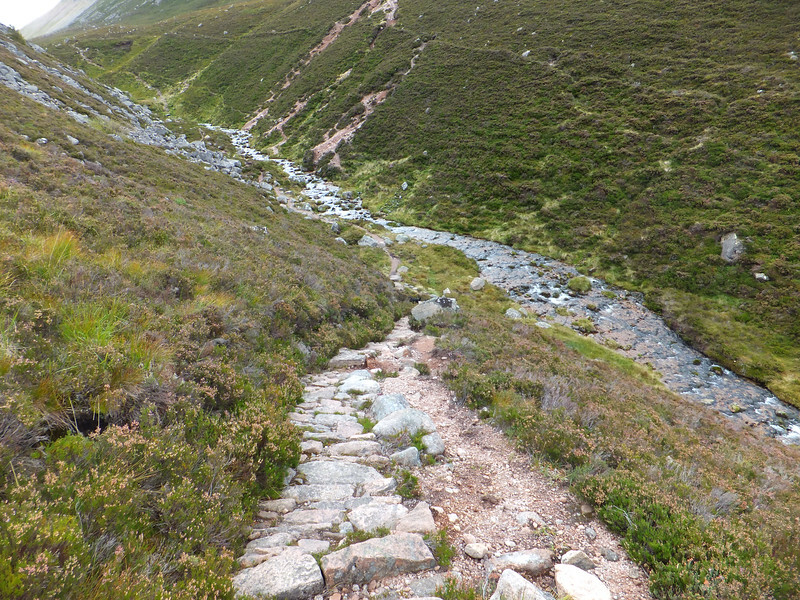 At the first bend a smaller path ahead would proceed through the Lairig Ghru, but keep to the main path zigzagging uphill, with stone steps here and there. 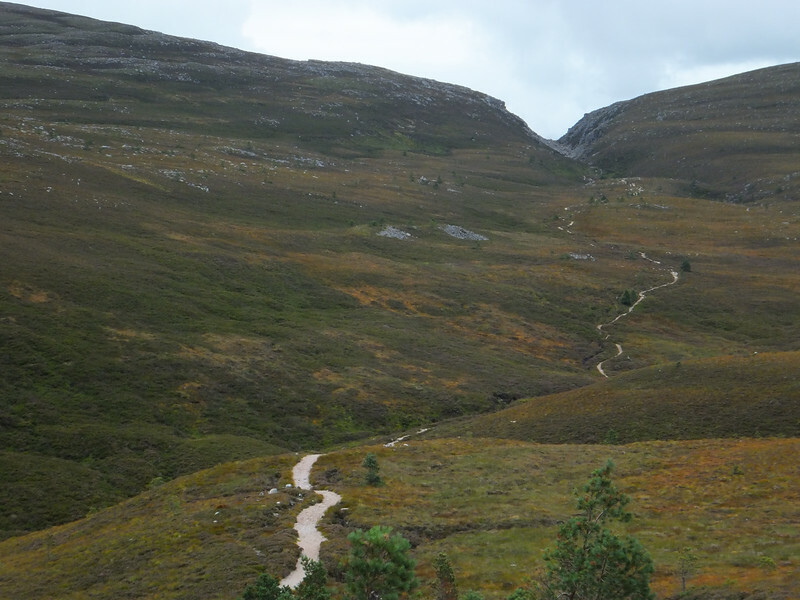 At 750m altitude the path bends left, up the steeper ridge of Sron na Lairige. 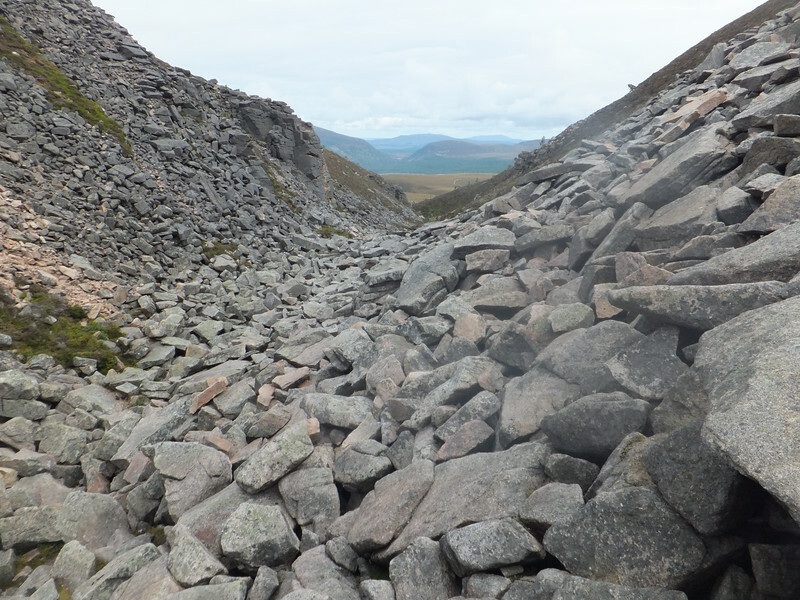 Resurfacing soon ends but the way is clear as there are large crags dropping on the left all the way up. 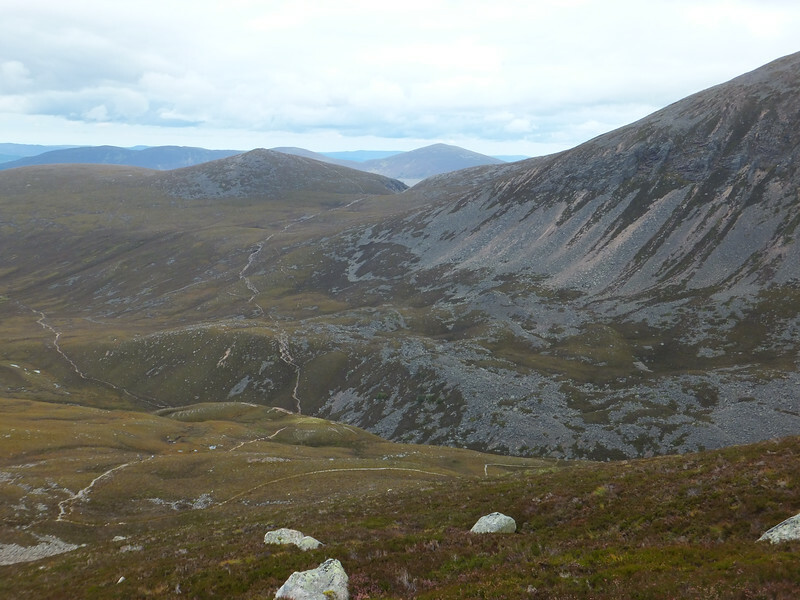 As ridge broadens, the now unclear path drops very slightly, then contours round the left (Lairig Ghru) flank of Sron na Lairige. 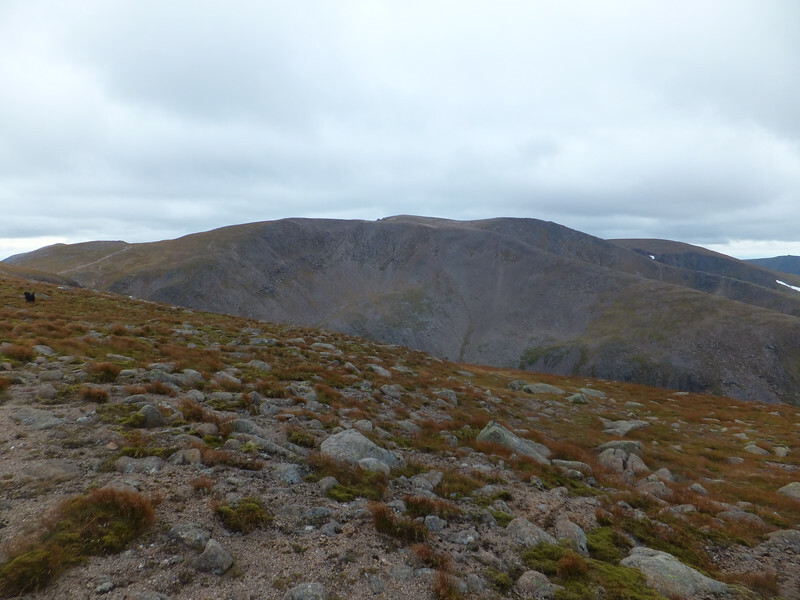 In mist its simpler to head south to the cairn on the 1180m north top, then across the slight dip to the main summit of SnL; then drop slightly east of south across stony ground with no clear path. 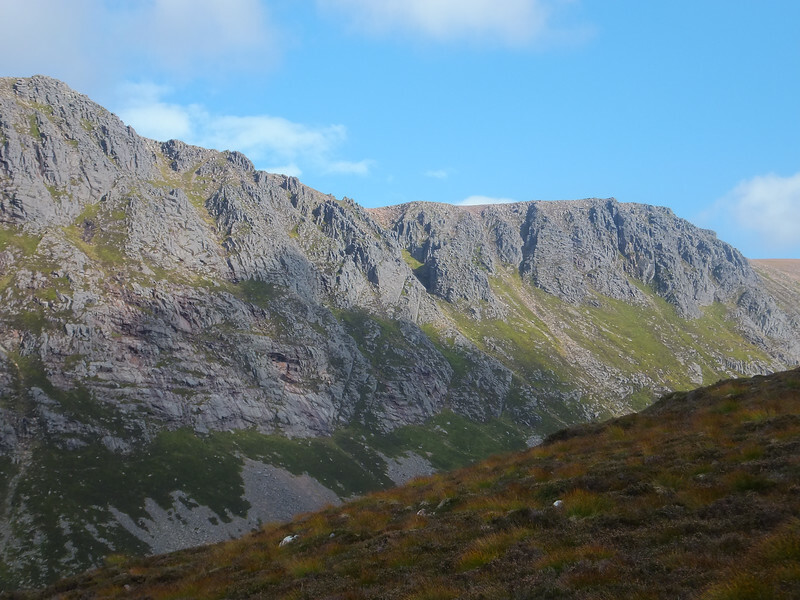 ...onto what becomes a clearly defined ridge with long drops into Coire Bhrochain on the left. 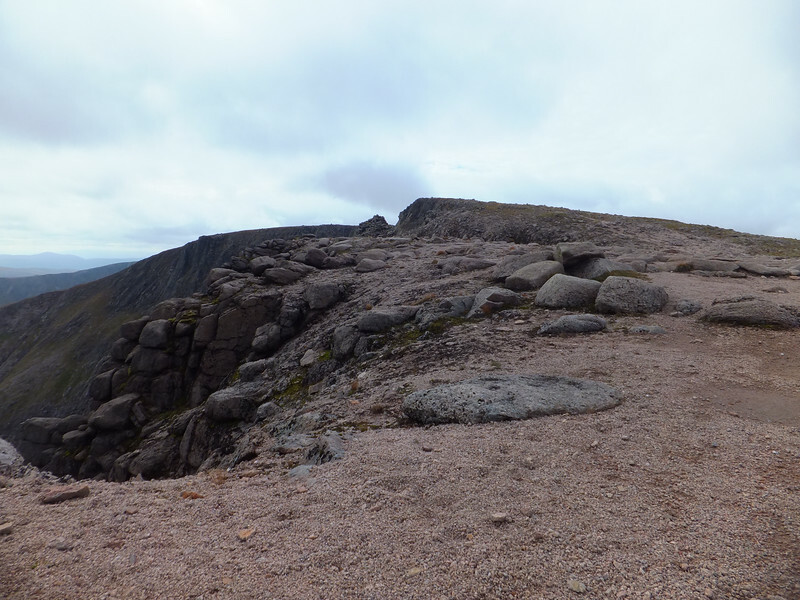 Follow the corrie rim west to a cairn. 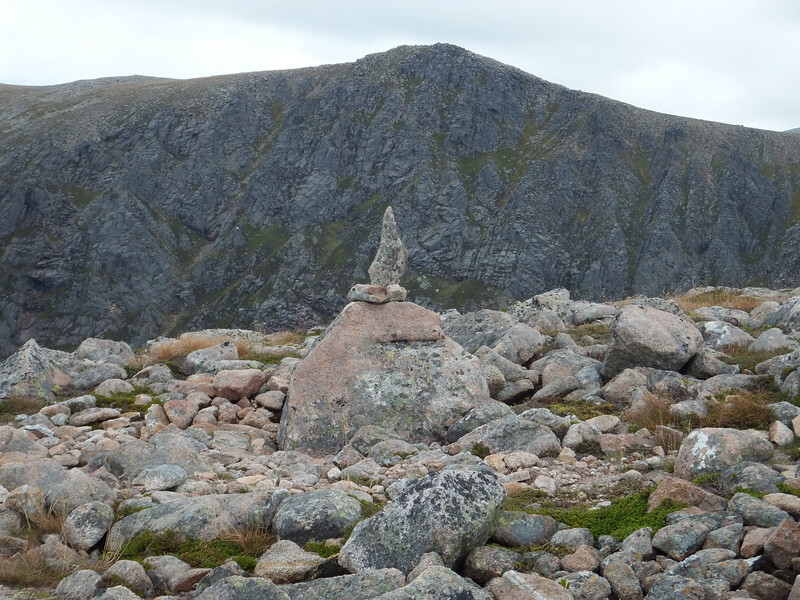 After the first cairn the ridge dips slightly. 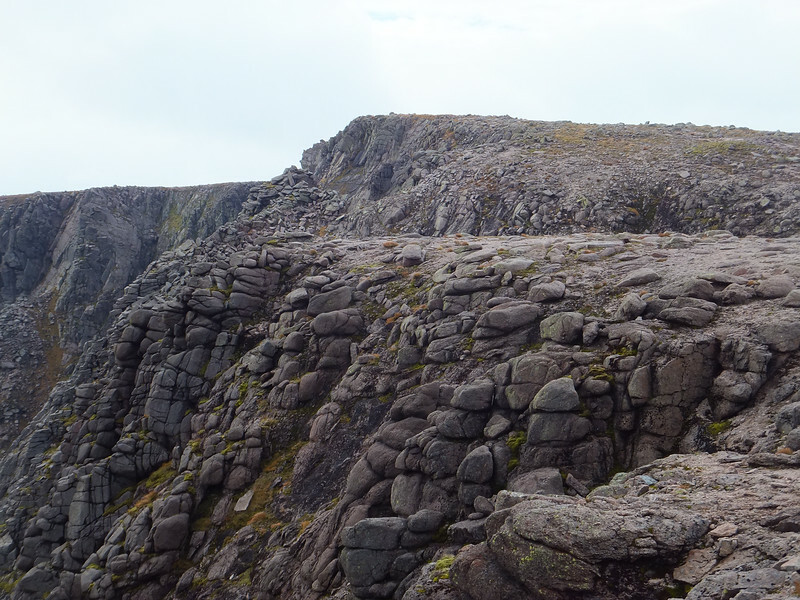 About 200m from the first cairn the crag rim rises again to a much larger cairn that’s the summit of Braeriach. 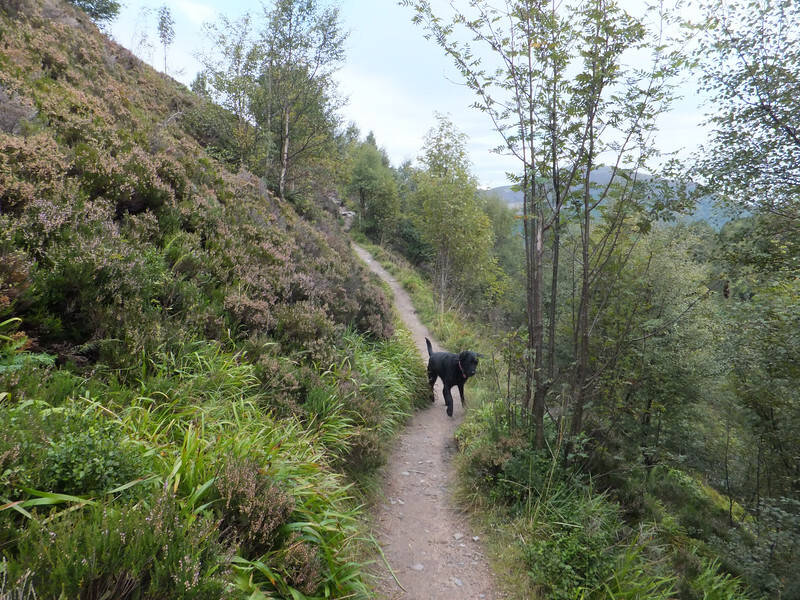 Whatever the weather though, it feels a long way back to yon footbridge!